African Clothing- African Pants Sets | Page 1 of 1 . Click Here to view more sale items. 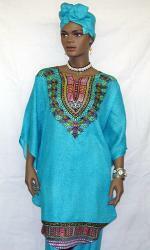 African Caftan Dress- Ethnic Swing botton short caftan with pants and matching headwrap. Available in all sizes and colors (Small - 4X-large). Fine Cotton and machine washable. Note: Pants sold saperately Perfect for all occasions. (Now! free shipping and handling). Please select your Butterfly dress color. African Dress- Elegance White and Black Makeba Pants set and Matching Headrwap. New Design! Perfect for and all occasions. Elegant way to show off your heritage. Available in most colors and sizes. Extra fee will be added to sizes (2XL - 6XLarge). Please select your Makeba Pants Set Size. African Dress- Elegant Purple and Gold Makeba Pants set and Matching Head wrap. New Design! Perfect for and all occasions. Elegant way to show off your heritage. Available in most colors and sizes. Extra fee will be added to sizes (2XL - 6XLarge). African Dress- Ethnic caftan pants sets with matching headwrap (Fit up to 65" bust and a roomy pants). Machine washable. Perfect for all occasions. (Now! free shipping and handling). African Dress- Ethnic caftan African dress with matching headwrap and pants (Fit up to 65" bust, waist and hips or 2X-Large). 100% rayon and machine washable. Perfect for all occasions. African Dress- Elegance Red and Gold Makeba Pants set and Matching Headrwap. New Design! Perfect for and all occasions. Elegant way to show off your heritage. Available in most colors and sizes. Extra fee will be added to sizes (2XL - 6XLarge). 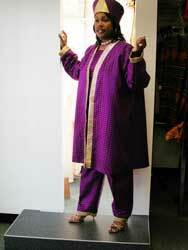 Exclusive purple george Swing Coat and Pantset, trim with gold border, Gele Headwrap Crown sold separately. Available in all sizes and colors. African Caftan Dress- Ethnic caftan pants sets with matching headwrap (Fit up to 65" bust and a roomy pants). Machine washable. Perfect for all occasions. (Now! free shipping and handling). Elegant African Millionstone Black Gold V-top w/Pants. Perfect for all occasions. 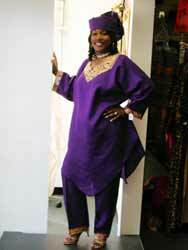 African Caftan Dress- Ethnic caftan pants sets with matching headwrap (Fit up to 65" bust and a roomy pants). Machine washable. Perfect for all occasions. (Now! free shipping and handling). Made in Ghana West Africa. African Dress- Elegance Purple Makeba Pants Set and matching Headwrap. New Design! Perfect for all occasions. Dry clean or machine washable. One Size Fit Most (72" wide x 56" long). Available in most colors. Note: Fitting instructions- Find the tie strings on both inside of the waist part of the dress, hold them with both hands and tie each to the back of your waist line for perfect fitting as shown on the picture. African Dress- Elegance Mudcloth Print Makeba Pants set and Matching Headrwap. New Design! Perfect for and all occasions. Elegant way to show off your heritage. Available in most colors and sizes. Extra fee will be added to sizes (2XL - 6XLarge). African Caftan Dress- Ethnic White and Gold caftan pants sets with matching headwrap. Hat Sold Separately. (Fit up to 65" bust and a roomy pants). Machine washable. Perfect for all occasions. (Now! free shipping and handling). Ethnic Swing botton short caftan with pants and matching headwrap. Available in all sizes and colors (Small - 4X-large). Fine Cotton and machine washable. Note: Pants sold saperately Perfect for all occasions. (Now! free shipping and handling).